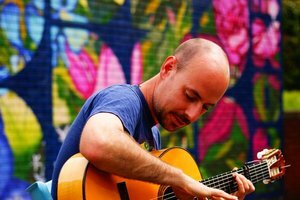 Originally hailing from Wiltshire, The Flamenco Thief is a fast rising star of the UK acoustic scene. He’s been dazzling audiences throughout the south-west with his often breathtaking and unique take on flamenco and now he is getting recognition for his experimental style throughout the UK. Like Bob Dylan in reverse, he played the electric guitar for ten years before moving over to the acoustic. He heard flamenco for the first time and was immediately drawn in. Just three years later and he's making waves with his original and lively sound. The Flamenco Thief has a character to his music that you are unlikely to hear anywhere else. Complex finger-picked melodies and percussive sounds made by drumming on the body of the guitar are layered over one another using his trusty side-kick, the Boss loop pedal. He has recently released an EP but the live arena is really where the Flamenco Thief comes into his own. As part of a series of UK dates throughout the autumn, he will be playing three gigs in London. Catch him if you can and prepare to be amazed! Just remember that he uses no pre-recorded samples or backing tracks – every sound you hear is played live.